The caption on this vintage postcard says “Peter Hunt Lane”. The east end street today goes by a different name– Kiley Court, home of Ciro & Sal’s Restaurant and various art galleries. But once upon a time this real estate was frequented by the multi-talented Peter Hunt who could take a beat up piece of old furniture and turn it into an decorative and functional item of beauty. His store and studio were known as “Peter Hunt’s Peasant Village.” He was inspired by Pennsylvania Dutch design motif styles, but gave his creations their own unique twist. 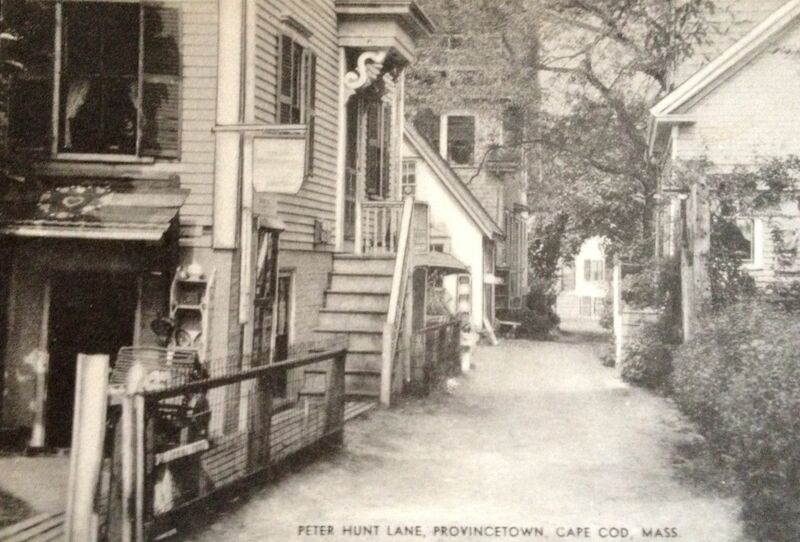 Hunt was a successful entrepreneur in Provincetown, Massachusetts during the 1930s and 40s and developed a following of collectors and imitators. By 1960 he had sold his Provincetown real estate and moved his studio and business Up Cape to Orleans where he opened Peacock Alley. Peter Hunt products with his original signature are valuable collectors items but when he died in 1967, his style of decorating had fallen out of favor. The novel Remaining in Provincetown takes place in approximately 1990 and Guest House owner Bruno does have one of his rooms, “The Yellow Room” decorated in the Peter Hunt style, because just a few decades after Hunts death, antique and design buffs recognized the significance of his artistry and Bruno is a character who appreciates the finer things in life.